Outside Baltimore’s vibrant American Visionary Art Museum (AVAM), a flurry of activity ensues as proud pet owners and their mostly furry companions sport their best reds, whites, and blues. Though the sun beats down relentlessly, everyone retains a cheerful glow of energy. Animals roam the area with curiosity, and while the percentage of pups is the largest by far, the party is open to the entire animal kingdom. Many species, from tortoises to rats to cats, are in attendance. Some are adorned with Independence Day-themed collars, others are set in handcrafted floats, all enjoying the holiday festivities. Pets manage to stay cool in the “Oasis,” a grotto behind the museum’s barn with little pools and misters. 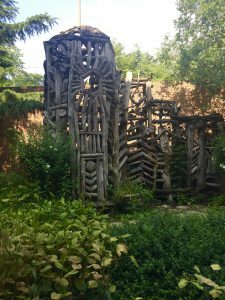 In the same area stands “Meditation Chapel,” a wooden structure crafted by artist Ben Wilson. To the left of the registration table, a volunteer is selling snow cones and water. Everyone is free to explore, mingle, meet other pets, and prepare to demonstrate their patriotic prowess. Started in memory of late volunteer and noted animal lover Ellis Rosen, AVAM’s July 4th Pets on Parade has become a Baltimore tradition. The main seating area facing the stage consists of about seventy chairs beneath a white tarp. There, awards are presented over the course of the three-hour event. Categories include Best Costume, Most Patriotic, Most Visionary Pet, and other honors. 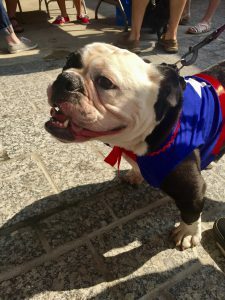 Each pet that is signed up for the parade is given a chance to strut their stuff and amaze the crowd with their tricks and costumes. During the processions, the museum is open to those interested in the fabulous art provided there. Though the parade itself is the main attraction every Fourth of July, AVAM is a sight to behold all on its own, as it continues to astound the public with incredible, poignant artwork and exhibitions. The center of its creation? “Intuition,” says founder and director Rebecca Hoffberger. “We focus more on the artist rather than the objects and consider what has inspired people to action.” This becomes clear upon viewing the museum pieces; each one is accompanied by a short biography of the artist and details the backstory of how it was created. AVAM celebrates the raw, true beauty of art and its use as an outlet of creative expression. While skill is an important factor, the spotlight is on the message and the background behind it. Many of the self-taught artists featured express the good, bad, and the ugly—all of what it means to be human. This unique perspective has shaped the museum into a force in the community, as it attracts thousands of visitors every year and earned the ability to hold such well-attended events as the parade. “Today, while we celebrate our personal independence, we also acknowledge the inter-dependence between nature and ourselves,” Hoffberger announces in a speech to the mass of red, white, and blue. “We celebrate the love that connects us to our pets, which allows us to be our best selves.” Looking over the crowd, it seems that no truer words could have been spoken. Smiling faces greet wagging tails, cooing voices whisper praises of encouragement. The bond between people and their devoted animals create an atmosphere filled with love. Yet this abundance of love for our pets does not overshadow the love for our country and the pride with which we call ourselves Americans. The parade symbolizes what we have fought for and would be willing to fight for: the freedom to create, the ability to act, based on our own intuition, and the ability to protect that which we hold dear. Error: Error validating access token: Session has expired on Saturday, 09-Mar-19 15:57:50 PST. The current time is Friday, 19-Apr-19 11:13:31 PDT.